There are Fish everywhere! Some of them live in fresh water, some of them live under ice, and some even live in the desert. 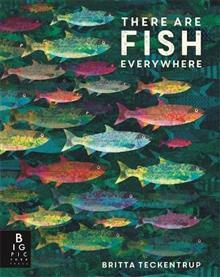 There are Fish Everywhere is the first in a series of non-fiction books from Britta Teckentrup. Young readers will learn where in the world all sorts of ani... read full description below. There are Fish everywhere! Some of them live in fresh water, some of them live under ice, and some even live in the desert. There are Fish Everywhere is the first in a series of non-fiction books from Britta Teckentrup. Young readers will learn where in the world all sorts of animals can be found and all the weird and wonderful things that they never imagined were true. This is non-fiction with spark and personality from a much-loved illustrator. Britta Teckentrup is an award winning illustrator, author and fine artist. She was born in Hamburg, growing up in a town called Wuppertal. She moved to London in 1988 to study illustration and fine art at St Martin's College and the Royal College of Art. Britta is the author and illustrator of many well-loved books for children, including the bestselling Big Smelly Bear, The Odd One Out and Grumpy Cat, which was selected by the Booktrust's Bookstart scheme - 250,000 copies to be distributed to families throughout the UK. Britta has written and illustrated over 70 children's books which have been published in over 20 different countries. Her fine art work has been frequently exhibited at her London gallery and at art fairs all over the world. After 17 years in the UK - Britta now lives and works in Berlin with her scottish husband, son Vincent and their old cat Oskar.